"Ain't no thing like me, except me!" Based on the blockbuster film Guardians of the Galaxy, this Previews Exclusive Guardians of the Galaxy Ravagers Rocket Raccoon Flocked Version Pop! 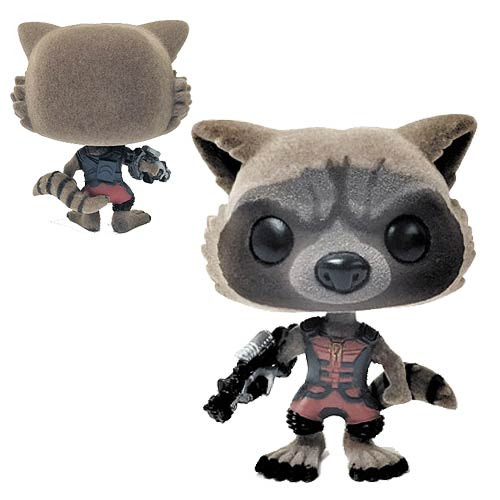 Vinyl Bobble Figure depicts Rocket as he appeared during the film's climactic final scenes - wearing the Ravagers uniform! Standing 3 3/4-inches tall, this figure comes packaged in window box packaging! This Guardians of the Galaxy Ravager Rocket Raccoon Flocked Version Previews Exclusive - San Diego Comic-Con 2015 Exclusive is a limited edition of only 3,000 pieces only.